Night mode for apps is getting more and more popular. They have a perk of less bothering our view with a darker design. In addition to that, they help save battery life of the smartphone. After many requests, Twitter won a dark version. But users were not entirely satisfied. The dark blue dark-mode social network did not please everyone. Some people already ask that this mode be the default for all apps on the phone. As it would bring a lot of benefits to people. According to Twitter CEO Jack Dorsey, the company will review the problem due to complaints. And they should apply the black color in the nightly version of the social network. In addition to Twitter, other apps already have a dark mode. For instance, YouTube, Wikipedia, Kindle, Google Maps, Waze and others. It is now expected that the next version of Android also has the option to be viewed in darker colors. These nightly versions may even be less harmful to health. They may lessen the smartphone addiction for some people. Moreover, it would less affect the sleep of users. Some people already ask that this mode be the default for all apps on the phone. As it would bring a lot of benefits to people. 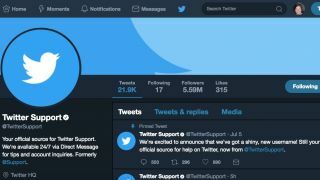 It is not yet known when Twitter will adopt black as the default for its dark mode.